As someone who plays basketball and who is certainly about their fashion, I have a great appreciation for bold collaborations that are executed beautifully. The latest installment for that has come in the form of a collaboration between Nike and Sony. Nike signature athlete Paul George of the NBA is the self-proclaimed biggest gamer in the league and his console of choice is the Playstation. With Paul George coming off one of the hottest signature shoe introductions in a long time, Nike and PG-13 were certainly looking to bring out the new silhouette with a bang and by hooking up with Sony to break out the PG2, they did just that. Now this release of the PG2 Playstation was extremely limited and only came out in just over a handful of locations. Releasing on February 10 via Nike SNKRS App and a couple Foot Locker stores both by like of the draw style, chances were definitely slim. As for me, I struck out just like the majority but then can another chances with the release at Nike ATL. After entering an in-store draw and winning I was able to secure a pair. Right off of the back I was highly impressed with the precision and smooth outcome of this pair. The navy blue and black combo hits perfectly along with the Playstation details within the shoe. Patent leather surrounds the heel of the shoe with signature Playstation controller triangles, circles, squares and Xs embroidered in. 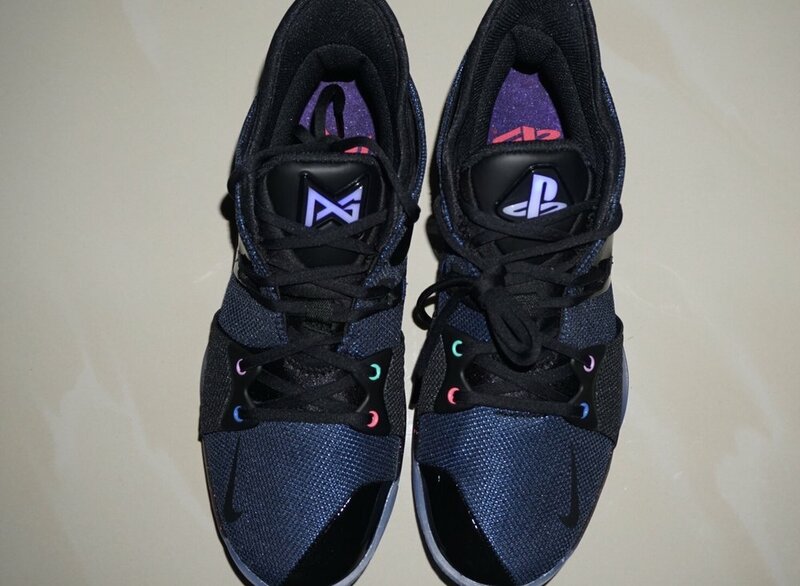 4 Playstation color themed Nike checks are on the outside and inside of the midsoles of the shoe. Also included on the outsole are glow-in-the-dark pods and a Playstation voucher with special Paul George themes on the heel tab. Not to be outdone are the tongues on the show that light up with the press of a button. While I'm not quite sure of the battery life within this feature I have heard around 150 hours. Overall I must say that the execution is top notch and actually am excited to see what is next between the trio. As an owner of an off-white PS4, could that colorway be up next?